Is that a multibyte character? On line 160 in the plugin file, they use substr instead of mb_substr. Barring that, the font being used might not support that character. @Linc announced the 2.8 release over a month ago. We had some some summary release notes, but the full notes had not yet been accumulated. I will be providing that here. Rich Editor is now the default editor for Vanilla. Embedded link previews. When you paste a link, you will see the site’s title, description, and a thumbnail image if one is available. Better user mentioning experience (All unicode characters supported). Pure WYSIWYG. No need to “Preview” your posts because they are always 100% accurate. Toolbars that stay with you and only show when you need them. No need to scroll up to find your menus when composing a long post. Seamless mobile experience that is just as rich as desktop. Enhanced accessibility including full keyboard-based interactions. Drag-and-drop image embedding and file attachments. Code formatting is now built-in (no other addon needed). When you edit old posts, it will continue to use Advanced Editor. We do not yet support the automatic conversion of old posts to the new format. Vanilla 2.8 ships with a new, fully responsive theme Keystone. Keystone ships as the default desktop and mobile themes on new installations and can be enabled on existing installations through the themes page. Theme Options Keystone ships with 6 preset theme options. Covering a different variety of stylistic choices and colour palettes. Add APIv2 documentation to the dashboard. Navigate to settings/swagger in your site to see API documentation accurate to the addons currently installed. Add ability to get info for the current user to Users API v2 endpoint GET /api/v2/users/me. Make Categories default to allowdiscussions=1. Fix limit parameter not being properly validated on APIv2 endpoints. Fix permissions updates overwriting all saved permissions for a category in API V2 roles. Add ability to expand category to index of discussions endpoint. Display ‘Unfollow’ option when filtering by followed categories. 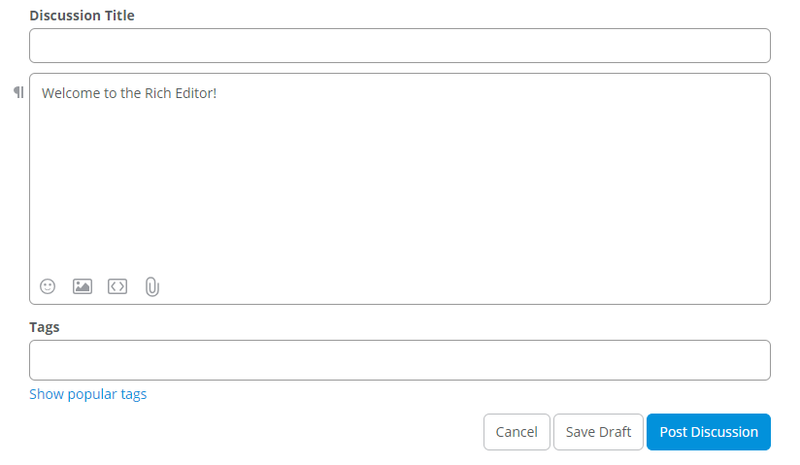 Move ability to set post formatting from the Advanced Editor to the /vanilla/settings/posting page. Fix drafts double escaping special characters. Disable hashtags within post contents by default. Add support for seconds-only time parameter to YouTube embeds. Add user option to disable/enable Q&A notifications. Fix recalculation of discussions’ Q&A status. Fix orphaning of UserRole records after the deletion of a role. Refresh page after adding/deleting bans. Refresh page after adding/deleting messages. Make minor aesthetic improvements to Dashboard, including using Open Sans font. Fix ban rules fatal error on search. Fix potentially overwriting another plugin’s spam detection results. Fix accepting answer giving external link warning. Improve accessibility by adding placeholder/title for text areas. Add translation support for “All” and “Following” in category following filter menus. Add JSON LD microformat to discussion pages. Default Vanilla Stats to use HTTPS. Steam Connect: Fix broken SSO connections (Steam’s endpoint moved to HTTPS). Fix category dropdown when editing drafts with old ‘DoHeadings’ setting enabled. Removed the cooldown period before re-prompting for password when changing email address in Vanilla. Improve performance across the application. Fix the display of IPv6 when viewing the Event Log. Fix search count on the User page in the dashboard when searching by IPv6. Fix post counters on profile pages exceeding allotted area. Fix duplicated language element in multiple RSS feeds. Fix Twitter callback URL for profile connections. Fix reactions menu items not redirecting to user profile. Fix comment and discussion count displaying as blank when the user hasn’t posted any comment or discussion. Fix leaving page links that are double encoded. Fix Profile page shows a thread as un-viewed to guest. Fix various UI issues and race conditions. Fix Checking for duplicate discussion foreignIds (for embed comments) when a user comments in 2 tabs without refreshing the page. Add nofollow attribute for social reactions (Facebook, twitter). Add extra CSS class for remember password. Add a class to @mention inside user content. Fix search API not joining all rows when requested limit exceeds resource limit defaults. Add CSS class to comments with same author as the discussion. This is a rather minor fix on our end, but it may have an impact on your set up if you are using API V2 anywhere on your side and you have a call set up with a limit parameter set higher than 100. This has always been our suggested limit; however, we were not properly validating that limit parameter. This meant that you could use an API call with a higher limit parameter, and your calls would be successful. The call would only start to return errors once the community had grown to a point where these API calls they set up would then start pulling so may records that it would exacerbate the API and return an error with little to no helpful information. Vanilla has implemented proper validation of the parameter so that we can return a valid error explaining that the limit should be lower than 100. Vanilla is transitioning away from the use of global functions. They are being slowly phased out in each release. If you are an addon developer it is recommended that you update your usages of these methods. Most notable of these is val which had over 5000+ usages removed from vanilla since the last release. The following events have been deprecated and will be removed in a future release. editorPlugin_getFormats - Use getPostFormats instead. categoryModel_categoryWatch - Category watching has been replace with category following. See the categoryModel_visibleCategories event. Welcome to the new OSS theme! Over the past few weeks I've been working on this new theme. I solicited the community's feedback, and am finally deploying it today. It's based off of 2.8's new default theme keystone. Even though theme is deployed improvements can still be made. Feel free to leave suggestions. I want to make a similar theme! 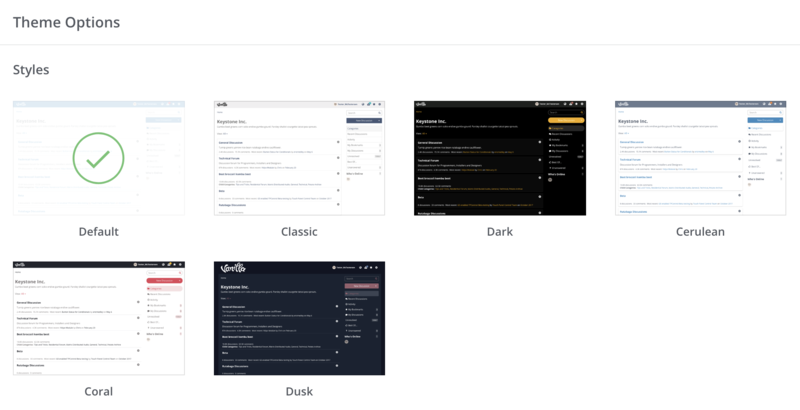 If you're looking to make a similar Vanilla theme, our @vanillaforums/theme-boilerplate package is the perfect place to get started. It starts you off with some good defaults and a large variable sheet to start modifying. It also makes it easy to add extra custom CSS on top and bundle it all together using our build tool. See our documentation for details. Do not forget to delete " cache " before use it .